Well, I finished and NOW is the big reveal that everyone has been waiting for! No jokes, at least if it is, no one told me. It is morning, I did not go to bed and have pulled an All-Nighter, and I’m still editing this post, taking pictures, editing the pictures, then placing the pictures into their spots, after changing the main focal of my line since I was being overly picky and I thereby ruined those cameos with no time left to order more. I had planned to use the traditional women cameos with my hand painted flair, but as I mentioned I started with the red and white resin cameo and painted her hair dark auburn. Then I decided to mix it up with a different cameo, but after first painting her hair blonde and not liking her hair light, I changed her to a darker brown with red high-lights. But of course, this is where my picky-ness caused issues because I couldn’t possibly have both women have dark hair, so I changed the other to blonde and that is where my current nightmare began…I had to sand some of her first layers of paint because it was coming out to thick, but I sanded too far and she lost her face (lol..lost her features). I also had a strange reaction when I used a sealer over some of the cameos, which caused the paint and inks to run, almost like they melted, so some of my fairies, little girl cameos, and cats looked as if they are either possessed, crying and mascara has smeared their faces, and as I said above I didn’t allow enough time to order more pieces or time to fix everything. Unfortunately, if I had listened to my mentor I would have never been in this predicament. One big lesson learned, because of experience is that I need to plan ahead. Brenda has been teaching myself and my classmates that we each need a plan, something in writing to refer to, to plan for mistakes, plan for extra needed pieces, and plan for chain that all matches that I am now out of…from this day forward I will have a plan. It’s okay to laugh, I’m laughing at myself, especially because I am getting quite tired and still have more to do. The Build a Line Challenge Master Class, sponsored by B’Sue Boutique where I buy almost all of my jewelry making supplies, and taught by the absolute best mentor- Brenda Sue Lansdowne, owner/jewelry designer- has officially ended with our final reveal Blog Hop. Please, please, please continue the hop following the list of all of my other classmates, with the list at the end of my post. We have all worked so hard to finish our first, beginning lines of jewelry that everyone is sharing throughout the hop and I know that you will enjoy seeing what everyone else did as well as myself. I know that I am truly excited to see what else my classmates have created and Brenda Sue created her own line too, which I can’t wait to see. Some of the biggest thoughts and advice if you’re considering taking next year’s class or if you have the opportunity to take a similar class, my thought is do it. There is never a good time, if you’re waiting, so throw all caution to the wind and just do it. Learning is something that can never get old and actually keeps us young..sshh, so I’ve heard…lol. These last three months have been so enlightening for me and not just in jewelry. Brenda shared so much with us, but also had each of us really taking an indepth look at ourselves. Where do each of us want to do with our jewelry and do we have big aspirations of being the next jewelry mogul? I am still not quite sure what I want. If someone had asked me one year ago where I thought I’ld be, had I even considered having my own Etsy store or for that matter, would I be selling my work? Then I would have said no. So much can happen to a person in such a short amount of time, it can be overwhelming. I have changed my mind so many times during the making process. I do know I will have a plan, even if it gets changed a lot because it will help to keep me on track, I will have deadlines for myself to keep the lines recreatable, easily ensuring I will have the key pieces in stock and in my inventory, if I decide to keep having a line. To me having a line is not really that different from creating OOAKs (One of a Kinds), except that the pieces will share pieces that are similar and that can be recreated, basically meaning more than one person can have that necklace or that bracelet. Maybe one person likes brass, or the “yellow gold look,” but someone else likes silver, with a line both people can get “the look” or color they want. Also, while there is one top piece that is the starter piece, it might even be a OOAK, the line will share pieces of this design for all levels of the price pyramid, meaning if your budget only allows you to purchase something from the bottom level, you can still get the same quality because the bottom pieces are held to my standard of anything I make regardless of price. So if you see a pair of earrings that you like and then decide you like one of the necklaces a couple of weeks later and you got your taxes back or earned a commision, you can purchase those and they will go together perfectly. For the final reveal I chose to use the resin floral cameos as my focus, but almost all of my cameo pieces are enhanced with my usual style of hand painting. I did use Gilder’s Paste in the silver, gold, black, and pinotage for each design I had in stock, and hand painted most with acrylic paints and a little Lumiere here and there. I also have some gorgeous acrylic stones and some decal pieces of glass cameos in limited supply, but all in all, everything whether it be the traditional woman’s portrait or fairies, unicorns, horses or cats, or the glass flowers, all relate to each other in some way creating some sub-lines within my line. The yellow bird, and porcelain and resin roses, rhinestones, and chain are prominent pieces and all going back to that one brass stamping that I just love for its design. It’s funny I completely forgot, I’ve been participating in this class and as I was looking through my papers to look up reminders on what to talk about in our blogs and was reminded that there is actually a winner of best in class and a runner up. During the past three months, judges have been silently listening in on our class, except for the weekends some chose to give advice and tips, as Alumni of the class of 2015. I, personally, would like to say “Thank You” to the Judges, Design Team Members and Admins, for taking your time to help Brenda with the class. I have learned so much from the discussions and your words of encouragement. And, not to put her last, but Thank you, thank you, thank you Brenda. I am so happy you are in my life. Now, please go visit my classmates and when you have time, stop by my Etsy store https://www.etsy.com/shop/SLGJewelryDesigns where I have mostly OOAKs (but that will change once I place an order for more supplies and get my new line of Cameos a bit more organized, then I’ll decide what else to make. I also have some gorgeous vintage pieces for sale too. Hope to see you all soon, enjoy your day..
Good-Night..I’m going to bed, its 8am. Beautiful hand painting on the cameos this is a very beautiful line! Great job on the cameo’s, Great post whimsical, felt your frustration with planning and jubilation at succeeding in spite of it all. Congratulations. Your cameos are magical! The brightly painted ones make me smile! Having painted some cameos now myself, I know how much work goes into that, so…wow! Serious dedication. Those monochrome/metallic pieces are stunning, you should have a whole line/subline of just those! Great job on your line, Shari! Sometimes mistakes teach us the greatest lessons. 😉 The painting on the cameos is lovely, and your designs are beautiful. Well Shari, firstly it’s been great going to class with you! Second, I’m very impressed with your painting and your line. You did an amazing job, and should be very happy. Congrats! Great blog. Loved reading about your process that you went through. Your jewelry pieces are beautiful! Bless your heart Shari, I could not have stayed up all night! But hey, you got ‘er done, hahaha. Your cameos are lovely; don’t know how you had the patience to paint so painstakingly beautiful. I wish you many, many sales. Your line is whimsical and colorful – it brings a smile to my face. Love the detail on your painted cameos, that takes a lot of time! As I think you saw on the facebook page I wrecked one of my lady cameos too, and actually didn’t even end up using them at all. I’m keeping the one I erased the eyes from because it just give me a chuckle! I have one piece of advice for your – relax and don’t be so hard on yourself – you are very talented! I think that I will start pulling all nighters if I can make mine look this wonderful! My favorite is the kitty 🙂 wonderful job!! Great blog post Shari. Love the painted cameos. Your line is very nice. Great job. I have Enjoyed reading Your Blog ! 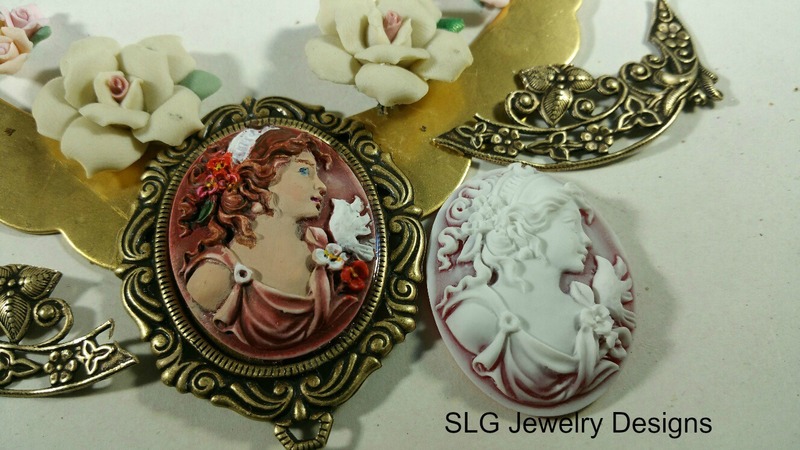 Your Handpainted cameos are Beautiful & All of Your Jewelry Creations are So Gorgeous. I also love all of your photos and I also love your precious cat. Congratulations in All of Your Accomplishments. Your cameo creations are lovely. So much colorful detail. Now that the class is at an end, what will you do next? I desperately need to place an order with B’sue, and we are working on turning our spare bedroom into my room and then, I don’t know. I’ll try to make more pieces and start promoting the line…You? Hi Shari what a wonderful blog post. The earring I created for this line were part of a mistake I made at the beginning. I ended up creating earrings I liked better than the originals. We all have mishaps.Hopefully we can create something beautiful from it. I like your flower cameo necklaces they are very pretty. Well done, you gave it 110% percent and came out ahead of yourself. The photos are very nice and clear and the painting is colorful and neat. I believe you will sell a great deal of cameo jewelry done like this. Keep up the amazing work…..and how did you know I love yellow roses? LOL…thank you Brenda. Actually the yellow was a guess. I had actually talked to Jordan early last week to double check the address and he said you were watching your sugar, so I had to revise what I was going to send you. The floral place had the little chickadee vase/cup that matched your rubber chicken and I couldn’t resist. I’m happy that you like them. Congratulations on making a very lovely line! I think the painted cameos are soooo pretty and I’m sure they will be good sellers! Shari, thank you so much for sharing your mishaps and successes in this post 🙂 I really like your statement piece with the blue flowers and crystal dangle – it is terrific! Wonderful blog post, Shari! Your hand painted cameos are so beautifully done. I really love the very first one in you post! You did a great job. I think you did a beautiful job with your pieces, Shari. I can’t tell you how many mishaps I’ve had along the way…far too many…but it is often something akin to a “mascara riddled cameo” which has taught me the best lessons. Your pieces are lovely, I adore the necklace with the green and gold flowers on the blank. What a terrific piece of eye candy that is! Here’s to a beautiful job, and to new paths for all of us. We’ve gained a great foundation for tomorrow!